While other countries, such as the USA, are changing their rules to allow all LGBTs to join the military, young men in Thailand are using the absence of such rules to actively avoid the dreaded military draft. Here, in the ‘Land of Smiles’, every Thai man at the age of 21 has to appear before a local military recruitment center to try their luck. Each eligible young man has to choose a card. If it is black, he is free, if it is red, he has to spend two years in the military. But many are either deferred (e.g. in the case of university students), or exempted, due to health or ‘other’ reasons. As ever, those from rich families always seem to get lucky…. The largest exempt group are the lady boys. But just in case you think that all a Thai man has to do is to dress up in women’s clothing and he will get an exemption, you should think again. Only those who go through the painful process of sexual realignment surgery will gain exemption – the rest will have to don military khakis and play at soldiers for two years. Those without influence will be sent south to risk the daily bombings and shootings by separatist terrorists. So the choice for many is either painful surgery or being blown up by an IED. We’ve all read crazy stories about drivers ending up in unbelievable places after blindly following the instructions on their GPS satnavs. 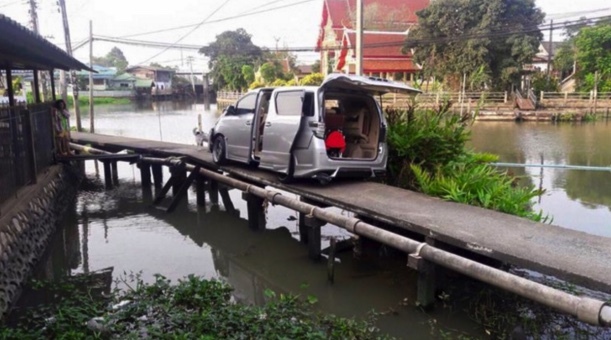 Only in Thailand could a mini bus end up, half way down a footbridge which is not even wide enough to accommodate all four wheels and with murky canal water swirling below. But there is more. T he driver was so ashamed of what he had done, that he abandoned the vehicle and ran away. In Thailand, no crime is greater than ‘losing face’….. Ever wondered what happened to all those cosmetics and other items that are confiscated or are thrown away at security checks before you board planes? You know – all those bottles and containers that look like shampoo, perfumes, cream and other cosmetics but which may contain liquid bombs? Well, if they happened to have been confiscated at Bangkok airport, wonder no more. 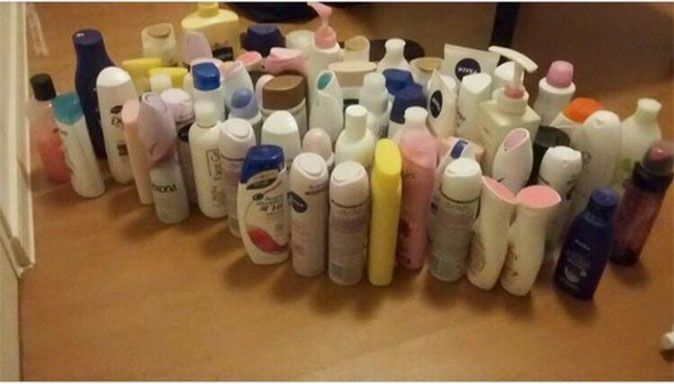 Someone is now running a flourishing online business selling all these confiscated /discarded items. Thai initiative? Or just plain wrong? 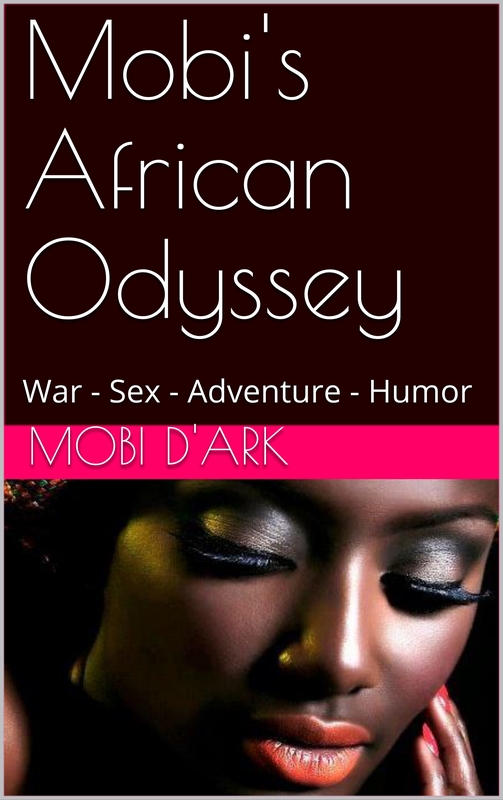 One thing’s for sure – the security personnel, who have to have their mucky fingers in this dubious business, have a good reason – other than security, to confiscate as many cosmetic items as they can get their grubby little paws on. How to deal with protesting monks? There’s been a bit of unease in the ranks of certain Thai monks of late, which has even led to a number of them protesting on the streets. 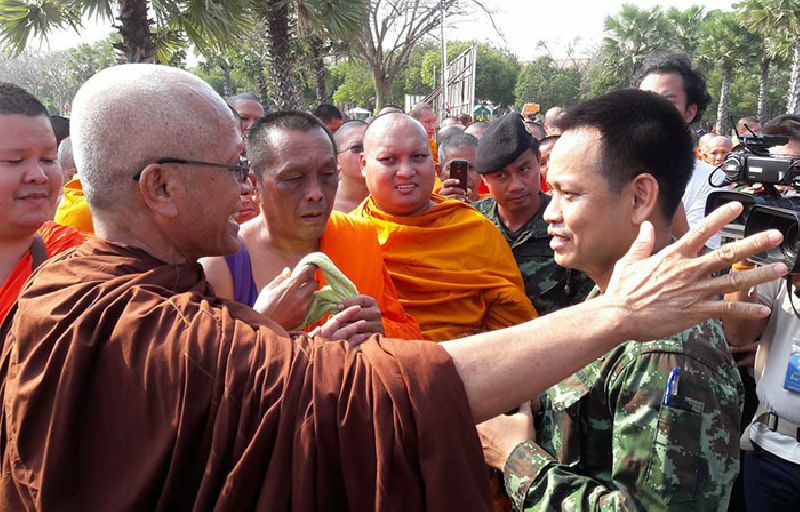 Now it isn’t an easy matter to deal with such protests, given that a vast majority of the population are devout Buddhists and to confront a Buddhist monk is tantamount to risking the status of your next life. But as with everything in the Land of Smiles – there is always a solution at hand. It’s easy – all you have to do is send a squad consisting of coyote girls, prostitutes, female masseuses and female soldiers to disperse them. This suggestion came from none other than a truly enlightened Maj. Gen. HSH Prince Chulcherm Yugala. The Prince stated that that physical contact with women would make the monks impure, and therefore cost them their celibate status. Hmm… are you quite sure about that, your highness? How about this lot in the front line?